What Is Foie Gras and How Is It Used? Foie gras (pronounced "fwah-grah") is considered a delicacy around the world. French for "fat liver," foie gras is the liver of a duck or goose that has been enlarged through a special feeding technique. Although popularized in France, foie gras actually has been around since the Ancient Egyptians learned that birds could be fattened by force-feeding. The technique is controversial, but foie gras remains one of the world's great luxury foods. Foie gras is sold either whole, as pâté, or as a mousse. It is then served in terrines or as a hot entreé or main ingredient. It is extremely fatty, with a very rich, buttery flavor and a smooth texture. In order to make foie gras, the duck or goose liver needs to be enlarged to nearly 10 times its size. This is accomplished by force-feeding corn to the animals using a feeding tube. This practice, known as gavage, originated with the ancient Egyptians in 2500 BC when they would force-feed birds to fatten them up for consumption. In France, the law states that "foie gras belongs to the protected cultural and gastronomical heritage of France." Gavage is controversial because force-feeding is seen as a type of animal cruelty that goes beyond merely raising the animals to be slaughtered for food. The culinary community is somewhat divided on the issue, with some chefs refusing to serve foie gras. Foie gras producers argue that it is possible to perform gavage in a humane manner: Geese and ducks are migratory birds that eat a large amount before migration, which means, in effect, the birds naturally fatten themselves. By timing the slaughter with these migration patterns, it is possible to produce a version of foie gras known as "fatty goose liver," which some view as a form of "ethical" or "humane" foie gras. There are a few traditional methods for cooking foie gras, from simply searing whole in a hot pan to pureeing and making it into a mousse. It melts easily, so while it is often prepared with high heat—such as pan-searing—cooking it this way can be tricky. A terrine of foie gras is actually one of the purest forms of preparations: The pieces of liver are layered in a loaf pan along with a bit of Sauternes or Armagnac and then the mold is weighted down, baked, chilled, and then sliced. Foie gras is also often made into a mousse, where cooked foie gras is pureed in a food processor along with brandy and butter to make a smooth, silky paste to spread on fresh bread. You will also find goose or duck liver pate, which is made by blending the foie gras with cream and other ingredients into a spread for crackers. What Does Foie Gras Taste Like? While both duck and goose foie gras are rich and buttery—some say beefy—in flavor, goose foie gras (foie gras d'oie) is considered the more refined, with a milder taste. Duck foie gras (foie gras de canard) can have a somewhat more gamy flavor, though it is slightly less fatty and thus better suited for high-heat cooking. All foie gras is made up of two lobes—one smaller than the other—that together create an oval shape. The liver weighs between 1 1/2 and two pounds. There are three grades of foie gras: Grade A, Grade B, and Grade C.
Grade A is the best quality, designating a liver that is the largest in size with a firm body, shiny exterior, and smooth texture. The color is consistent and there are no blood spots or blemishes. A Grade A foie gras should have a sweet smell and is used in the simplest of preparations, such as searing and sauteeing. A two-pound Grade A liver can cost as much as $125. Grade B foie gras has the same rich taste as Grade A but is smaller with visible veining and defects and has a softer texture than Grade A, making it ideal for pates and terrines. Grade C, the lowest quality foie gras, is not as prevalent as the other two and is used mostly to flavor and thicken sauces. Whether you purchase goose or duck whole foie gras, you have the option to prepare it in a few different ways: searing it whole, processing into a pate, layering in a terrine, or purreing into a mousse. The rich, buttery flavor marries well with fruit like apples, grapes, and figs, as well as balsamic vinegar. Foie gras is available fresh, whole, raw lobe, or fully cooked medallions or terrines that you can slice and serve. 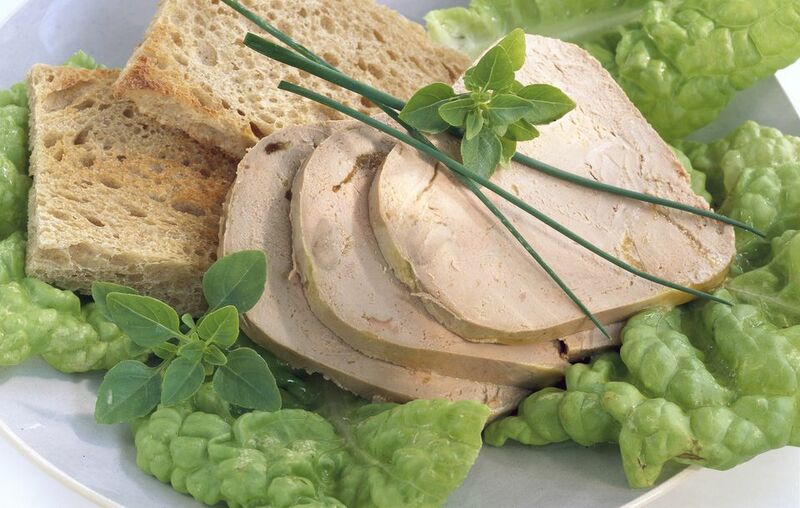 Fresh foie gras can be hard to find in grocery stores, so you will want to check gourmet shops as well as online. Prices vary, depending on where and how the product was made, and the animal used (goose is more expensive than duck). Unopened foie gras will keep for up to three weeks in the refrigerator in its original (usually vacuum-sealed) packaging. Once opened, fresh products should be eaten within two days. Pâté and other fully cooked products can last a year or more unopened (check the label). You can freeze fresh foie gras, but use it within a day or two after thawing. Foie gras is not only considered a luxury food because of its price tag and how it is made, but also because of the extremely high fat content; a 1-ounce serving of foie gras contains 12.4 grams of fat (a third of which are saturated), making up 20 percent of the daily recommended value of fat. Therefore, it should be consumed sparingly. There are also 130 calories and 42 milligrams of cholesterol per serving.